Built in 1929 By O'Connell in Quincy,MA. 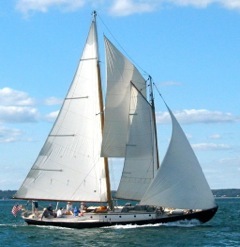 Purchased in 1973 from John Black, name changed to "Ishmael" from "Nightwind"
Ishmael was one of at least 5 boats of this design bullt in late 1920's and 30's. Others still around "Mistress", Fl. and "Wild Goose", Chicago,Il.